Almost seventy years of experience, working and studying “in the field”, with high quality standards for development and production of our products and in-depth knowledge of materials. These are just some of Fila’s strong points, making our dynamic company a leader in protection and care of surfaces in marble, natural stone, porcelain stoneware, terracotta and wood. Fila products are sold in more than 60 countries, thanks to 5 foreign commercial branches (France, Spain, Germany, the United Kingdom and the United States) and a capillary sales network worldwide. Thanks to partnerships with over 180 of the most important international floor and wall covering manufacturers, Fila is always updated about sector trends and ready to develop and test new solutions to meet client requirements. Fila offers a complete range of certified products, devised for professional treatment specialists and also suitable, thanks to their effectiveness and ease of use, for end users, including those who are not DIY experts. Fila today is a solid company, which continues to grow and expand worldwide, combining the tradition of a family company with a modern managerial organisation that firmly believes in innovation and research. The company was set up in 1943, when brothers Guido and Pietro Pettenon founded Fila, Fabbrica Italiana di Lucidi e Affini. Initially the company mainly produced shoe polish and household waxes and detergents. In the seventies, Adriana and Beniamino Pettenon, the latter still today at the head of the company, chose to specialise in professional products for the protection and care of floors. This intuition led Fila to become one of the most important companies in the world for surface treatment, valued by major international manufacturers of floors and wall coverings for the building industry, which recommend Fila products. 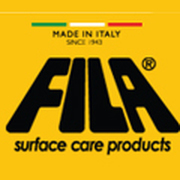 Purchase Fila tile and stone Sealants and Cleaners online at TilesDirect.net.